Tandoori chicken. Photo courtesy of Babu Ji. Indian food lovers, meet Jessi Singh. He's the chef behind the headline-grabbing restaurant Babu Ji, which has locations in Melbourne, New York City, and San Francisco. For those who can't snag a reservation (or stand to wait in line), he shares his favorite eateries in NYC and SF. 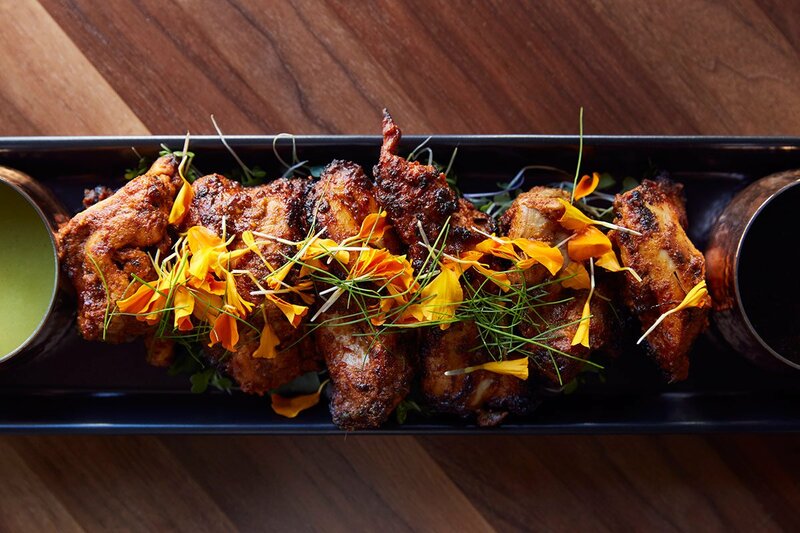 For those who want a taste of the place, here's his recipe for succulent tandoori chicken. I love tandoori chicken, but many preparations have an unnatural orange color and tend to be overcooked. After much testing, I came up with a super juicy, tender version. I marinate boneless skinless thighs (as opposed to breast or leg) in yogurt, ginger, garlic, and lime juice overnight. In a large bowl, mix all the ingredients together to make a marinade. Trim the fat from the chicken and cut into medium pieces. Place the chicken in marinade and massage into chicken. Completely cover the chicken with the marinade. Refrigerate for at least 4 hours (overnight is better). Reduce the orange juice on low heat to approximately 1/2 cup (15-20 minutes). Add thyme while reducing. Strain orange juice and add olive oil. Mix the lemon juice and olive oil together. Combine the fennel with salad greens. Wash and peel the mango and dice. Julienne the carrot and ginger. Mix mango, carrot, ginger, spring onion, and lemon dressing. Salt well. Arrange the marinated chicken on a clean and oiled grill or grate over medium-high heat. Grill for approximately 4 minutes on each side, letting the flames slightly char some bits of the chicken. Let the chicken sit for 5 minutes in a bowl and then mix with orange dressing. Cover a serving plate with green salad and place dressed chicken atop the salad bed, pouring over the juices from the chicken and the remaining lemon dressing. Spoon mango salsa atop the chicken and sprinkle ginger, carrot, and spring onion on top. Tell Us, Babu Ji: Where Do You Eat in NYC? Jessi Singh is the chef and co-owner of Babu Ji in New York and San Francisco. You can follow him on Instagram at , and . He travels for the pursuit of eating around the globe.